Italy: a place where wine flows like water, pasta is consumed all day long, and beautiful homes are located. Whether you are in Tuscany or Rome, you can always count on seeing incredible architecture and home design throughout this magnificent country. What's not to love about Italy? 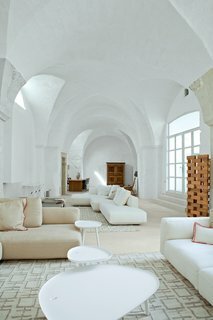 Take a step inside ten of our favorite modern Italian homes and get inspired to plan your next vacation (or, pack up and move there). A pair of matching Idea lights by Vesoi over a dining room table and chairs, both locally-made. 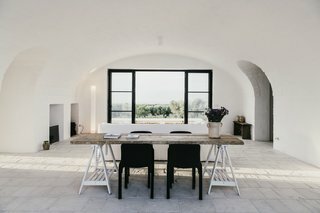 Designed as a modern-day farmhouse, Masseria Moroseta uses local materials, traditional building methods, and details from the local architecture, resulting in a building that fits perfectly within the olive trees, a real Pugliase vernacular. The Masseria is a working farm of organic olive oil, and has six suits with private gardens, for holidays immersed in the countryside, with views to the sea. Upstairs, a wooden slatted wall doubles as a bookshelf. The original structure of the building has been able to enhance the quality of the environmental context, establishing a continuous dialogue between the surroundings and the construction. 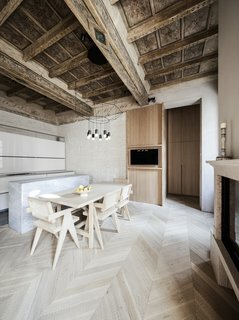 Formerly the residence of a rich family from Milan, the property has recently undergone a complete restoration, divided into smaller apartments. 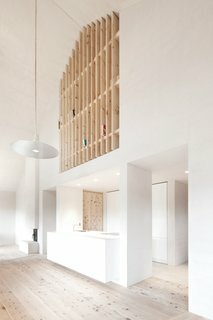 Wigglyhouse is a single-family residential building located in a difficult context 50km away from Milan in Italy, characterized by multi-storey buildings that surround it. The covering reaffirms this principle. Canadian gray granite covers the entire building to symbolize this idea of protection with the exception of the walls where the volume is subtracted by the grey-plaster made patios. The pitches of the roof alternate, "wiggling" the sequence of the lines of the roof section. 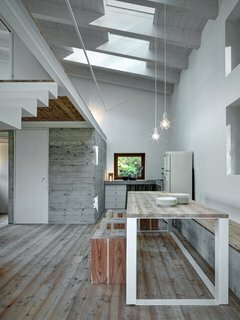 And even in areas where the light is a more pragmatic tool, it is integrated wonderfully, as in the long indoor pool and in the minimally modern bathroom. Each light feels like an architecture in and of itself, dancing through the home in a game of reflection and feedback. So while the home stands proudly during the day, it is at night that its true nature comes to light. 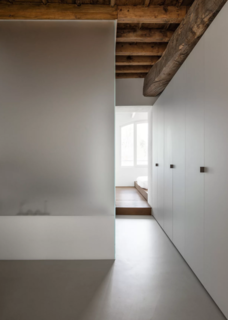 The project involves the recovery of an entire multi-story building located in the consolidated urban area of Mantua, in which the apartment constitutes a portion of the building. The house is characterized by its decorations in the ceilings and walls that date back to 1500’s, as well as the first half of the 1800s. 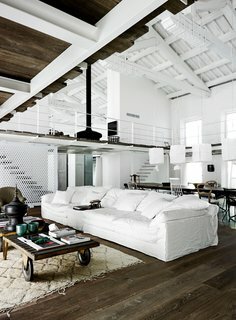 In the seating area, a trolley found at a flea market functions as the coffee table alongside an expansive Navone–designed sofa for Linteloo. Custom pendants by photographer Mark Eden Schooley hang above the dining table. At the far end of the living room, an old armoire—an inherited family heirloom—stands as a sober counterpoint to all the sleek Italian contemporary design in the five-bedroom house. In the dining area a vintage table from a shop in Barcelona is surrounded by Giandomenico Belotti Spaghetti chairs. 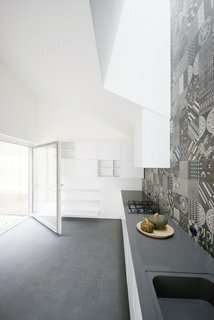 The space, which also includes the kitchen, occupies a 1970s addition.